Green Machine/Blue Space relies on a hydrogen fuel cell to convert and store energy collected by the house's photovoltaic system. New York Institute of Technology partnered with the U.S. 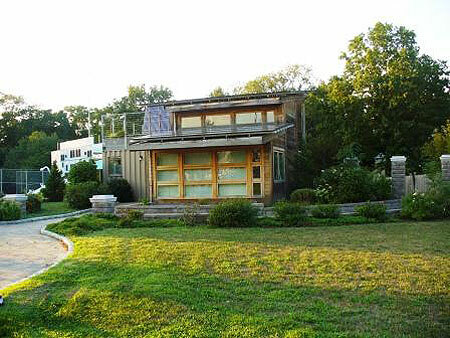 Merchant Marine Academy to develop a solar-powered house for the U.S. Department of Energy Solar Decathlon 2005. The house, called Green Machine/Blue Space, was reconstructed at the U.S. Merchant Marine Academy in Kings Point, New York, where its systems could be actively managed. On June 19, 2006, a dedication ceremony marked Green Machine/Blue Space as "America's First Solar-Hydrogen Home" because it relies on a hydrogen fuel cell to convert and store energy collected by the house's photovoltaic system. The ceremony followed commencement exercises in which President George W. Bush delivered the keynote address. Greg Sachs—the team's lead engineer—lived in and monitored the house for about one year before leaving U.S. Merchant Marine Academy to start a solar installation company with his fellow decathletes. As their business grows, the house continues to serve as a valuable research tool. An on-campus student group called the Kings Point Sustainability Alliance is working to design and build a solar heating system for the house. Their work is guided by the U.S. Merchant Marine Academy's Alternative Power Program.